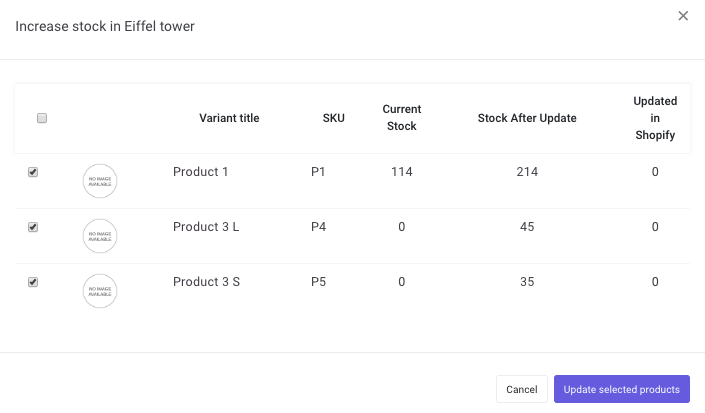 Inventory Planner provides the ability to push received inventory quantities to your eCommerce platform (Shopify, BigCommerce, WooCommerce, Magento, Neto, and Prestashop). In your Purchase Order, enter amounts of inventory received. Then click 'Save'. You will see the amounts received and the date they were received. 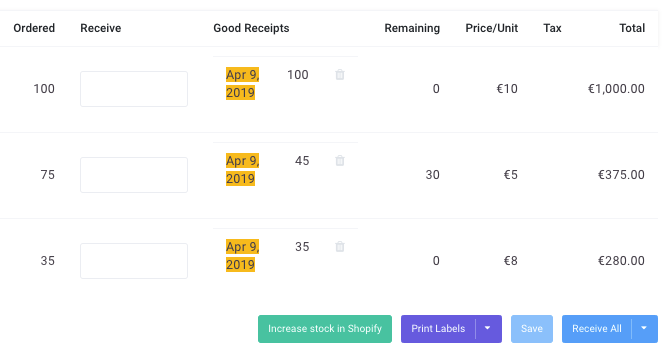 Click 'Increase stock in Shopify' (or your connected platform such as BigCommerce and Vend). In the pop-up, you'll see variants that have been received, current stock level (as of the last sync), what the stock will be after adding received quantities, and any quantities previously updated in Shopify from this purchase order. To push inventory to your store, click 'Update selected products'.